Roses have a reputation for getting all kinds of diseases. While modern roses are a lot less prone to problems than the tea roses favored not so long ago, there will inevitably be seasonal rose problems to deal with. Most rose diseases are caused by damp or humid weather. While you can't do anything to control the weather, you can give your rose bushes good air circulation, so they are able to dry off as best they can. This will help avoid rose diseases to some degree, but not entirely. You will also need to keep tabs on your rose bushes so that you can remedy any bad situation before it gets out of hand. Be sure to accurately identify the problem before reaching for a spray and start with the least toxic solution. You can read more about organic controls in An Overview of Some Common Organic Garden Pesticides. Black Spot: Black spot is a fungus that is very common during humid weather because it is a water-bourne disease. As its name implies, small black spots form on leaves and stems, eventually causing the leaves to drop and weakening the plant. Treatment: Choose black spot resistant varieties and be meticulous about sanitation. Water the roots of the rose, avoiding the foliage. Water in the morning, so that splashed leaves have time to dry off. If Black Spot is an annual problem, try a dormant spray of lime sulfur at the end of the season and again in early summer. Once Black Spot appears, it is hard to stop. Neem oil and Sprays containing Potassium bicarbonate are somewhat effective. Downy Mildew: Downy mildew is a very serious disease that spreads rapidly and can defoliate a rose plant in days. It is not as common as Black Spot and favors cool, wet weather. Purple spots with yellow edges form , often on the veins on the top side of the leaves and along the stems. Pale gray fuzz can form on the under side of the leaves. The leaves will eventually become brittle and fall. Treatment: The good news is that Downy Mildew often clears up with the weather. To reduce the chance of Downy Mildew, practice good garden sanitation and keep the rose plants well pruned for air circulation. As with other diseases, a dormant spray may help. Rust: A Rust infection is easy to spot. Small orange pustules spots form on the undersides of the leaves. This fungus can also cause defoliation. Rust is most prevalent when nights are cool. Treatment: Treatment of Rust is similar to treatment of Black Spot, above: Good sanitation and a preventative dormant spray after pruning. Once infected, remove all infected leaves and try Neem oil for control. Mosaic Virus: Once a rose is infected with Rose Mosaic Virus, there’s not much to be done except check with the nursery for a replacement. 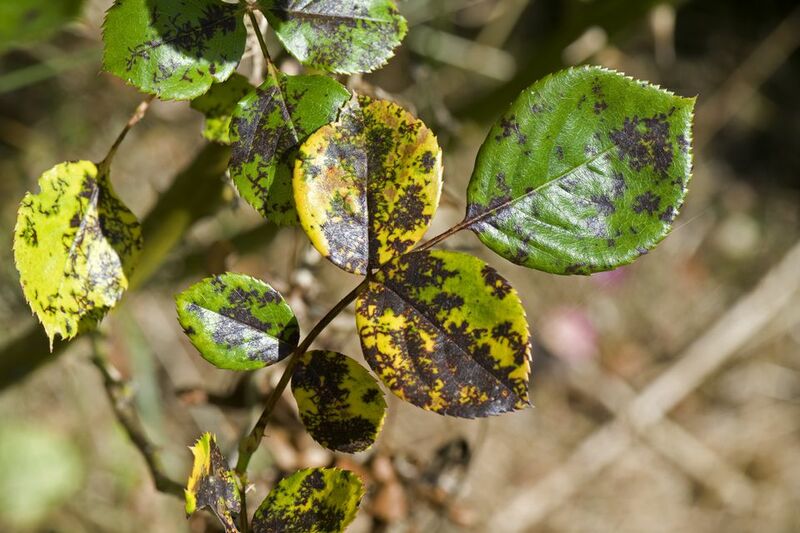 Rose Mosaic Virus shows up as yellow mottling on leaves and deformed new growth. It can stunt growth or it can be a mild infection. If there are only a few affected leaves, the plant may continue growing and blooming fine. The really good news is that it won’t spread to your other roses. Read Rose Growing Problems - Prevent Rose Problems Before They Occur, for advice on avoiding these diseases and other problems.